We are the new show for the Indigenous Student Centre, called IndigeTime! We will be your hosts for the year, my name is Chels and my co-host is JT. This was our first show and we hope everyone enjoyed it. As we did in this show, we will begin each show with a Territorial Land Acknowledgement. If you missed the show, we explained that it is important to recognize the unique and enduring relationship that continues to exist between Indigenous peoples and their traditional territories. To go beyond this simple acknowledgment we also wanted to discuss events that are happening on this traditional territory. St. Paul’s 14th Annual Pow Wow is taking place on Saturday, September 23 from 12-5pm. The Pow Wow will be held at Waterloo Park. Admission is free and everyone is welcome! Make sure to come by and visit JT and I at the Indigenous Student Centre booth at the Pow Wow as well! How do we stay centred, open and connected in these complex times? Spend an afternoon with Tom Jackson to hear him speak on these subjects. The afternoon will begin at 3pm on Sunday, September 17th at First United Church. We focused our “Spotlight Segment” this week on the popular Indigenous music group, A Tribe Called Red (ATCR). 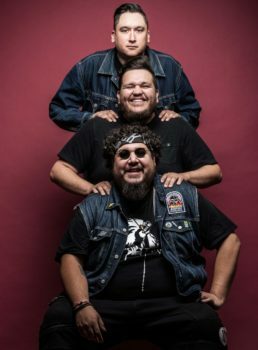 The three members of the group include, Ian “DJ NDN” Campeau (from Nipissing First Nation), Tim “2oolman” Hill (Mohawk, from Six Nations) and Bear Witness (Cayuga). They are Juno Award winners, and are currently finishing their tour for their newest album We are the Halluci Nation. During the show, we began our look at ATCR by discussing their influence on Indigenous youth. ATCR has created a trailblazing legacy in the music industry. They have made Pow Wow music mainstream, and arguably in doing this, they have also helped bring Indigenous people and Indigenous issues into mainstream media as well. They have made Indigenous culture mainstream in a way that has never been done before-in a way that pays respect to those distinct nations. Tim “2oolman” Hill has said, “We’re making music for Indigenous people. We’ve been misappropriated in film, in media- all of that stuff, forever. We’ve never appropriated ourselves.” This quote from 2oolman shows the immense power that is given back to Indigenous people when they are appropriately and fairly represented in popular media. The Indigenous people are in a revolution, and they are taking their power back. Another aspect that we found interesting about ATCR is their process for incorporating traditional Indigenous music into their work. When making music that is unique to a specific nation, they have expressed that they follow “protocol.” This protocol includes consulting community members and elders on which songs are sacred and how to incorporate the nation’s music in a respectful manner. In creating their newest album, ATCR collaborated with Indigenous people from around the world, such as Australia. We also played recordings from parts of their interview with Studio Q. In the interview, they discuss the changes that they have noticed within Canadian culture in terms of their willingness to listen to Indigenous voices. When asked by the interviewer what this new music represents for Bear Witness, he expresses that the new music represents hope to him. A hope not only for the Indigenous youth in the country, but also hope for opening up a much-needed conversation between Indigenous peoples and the settler population. I included the link for the full interview below so don’t forget to check it out. If you enjoyed this week’s show, or if you missed it, don’t forget to listen next week. We will be on air every Wednesday from 4pm-5pm. Also feel free to drop by the Indigenous Student Centre for a visit or an event! We are located across from the university on 187 Albert Street.